Have a great lesson plan to share with the PE Central Community? Submit Your Lesson Plan or Idea for a chance to win a FREE 6-pack of 8" Gator Skin Balls! Our editorial team have provided guidelines that will help you in submitting your lesson plans/ideas and will review all submissions to ensure they meet PE National Standards and developmentally appropriateness. 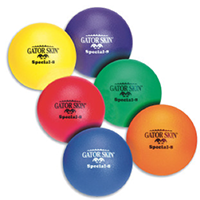 If we publish your lesson plan/idea on PE Central, you will be entered into our monthly drawing to win a FREE 6-pack of 8" Gator Skin Special Foam Balls - valued at $85 - from our Primary Sponsor S&S Discount Sports. 2 winners will be selected every month! View rules. DISCLAIMER: By submitting an idea to PE Central you are agreeing to allow PE Central to publish it on our Web site. You also agree to give PE Central the right to share and sell it in other forms as well (e.g., in other print forms, media, Websites, etc.). In all instances we will give you full credit for the idea and will include both your name and school along with the lesson plan/idea. Please note that some publishing companies consider posting ideas on a Web site as having published the idea and will then not accept it for publication in a journal or other written publication. We want to remind you that not all ideas or lesson plans submitted are published on PE Central. In fact, approximately 60-70% of the submitted ideas do not get accepted for for publication. It is important to understand the decisions not to publish an idea are not personal in any way. If you are a college student submitting a lesson idea without having your college or university professor review it please share the following link/information with your college professor: Pre-service eacher Submission Guidelines.